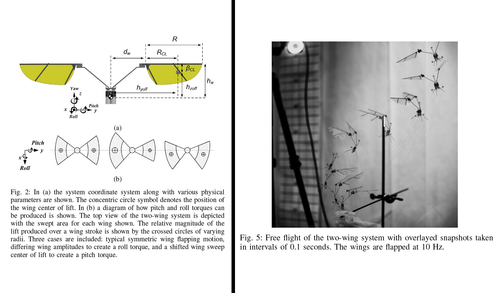 Colmenares, D., Kania, R., Zhang, W., Sitti, M.
In this work, we examine several wing designs for a motor-driven, flapping-wing micro air vehicle capable of liftoff. The full system consists of two wings independently driven by geared pager motors that include a spring in parallel with the output shaft. The linear transmission allows for resonant operation, while control is achieved by direct drive of the wing angle. Wings used in previous work were chosen to be fully rigid for simplicity of modeling and fabrication. However, biological wings are highly flexible and other micro air vehicles have successfully utilized flexible wing structures for specialized tasks. 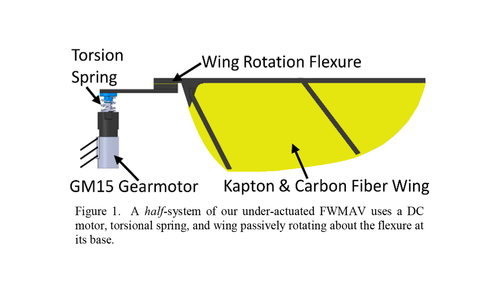 The goal of our study is to determine if wing flexibility can be generally used to increase wing performance. Two approaches to lift improvement using flexible wings are explored, resonance of the wing cantilever structure and dynamic wing twisting. We design and test several wings that are compared using different figures of merit. A twisted design improved lift per power by 73.6% and maximum lift production by 53.2% compared to the original rigid design. Wing twist is then modeled in order to propose optimal wing twist profiles that can maximize either wing efficiency or lift production. This paper presents a new soft-bodied millimeterscale swimmer actuated by rotating uniform magnetic fields. The proposed swimmer moves through internal undulatory deformations, resulting from a magnetization profile programmed into its body. To understand the motion of the swimmer, a mathematical model is developed to describe the general relationship between the deflection of a flexible strip and its magnetization profile. As a special case, the situation of the swimmer on the water surface is analyzed and predictions made by the model are experimentally verified. Experimental results show the controllability of the proposed swimmer under a computer vision-based closed-loop controller. The swimmers have nominal dimensions of 1.5×4.9×0.06 mm and a top speed of 50 mm/s (10 body lengths per second). 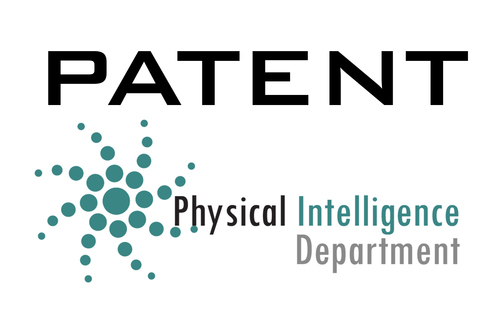 Waypoint following and multiagent control are demonstrated for swimmers constrained at the air-water interface and underwater swimming is also shown, suggesting the promising potential of this type of swimmer in biomedical and microfluidic applications. Marvi, H., Song, S., Sitti, M.
Optimal fiber designs for the maximal pull-off force have been indispensable for increasing the attachment performance of recently introduced gecko-inspired reversible micro/nanofibrillar adhesives. 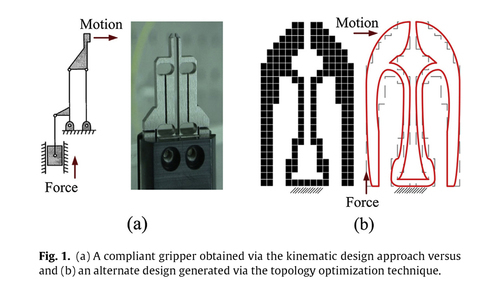 There are several theoretical studies on such optimal designs; however, due to the lack of three-dimensional (3D) fabrication techniques that can fabricate such optimal designs in 3D, there have not been many experimental investigations on this challenge. In this study, we benefitted from recent advances in two-photon lithography techniques to fabricate mushroomlike polyurethane elastomer fibers with different aspect ratios of tip to stalk diameter (β) and tip wedge angles (θ) to investigate the effect of these two parameters on the pull-off force. We found similar trends to those predicted theoretically. We found that β has an impact on the slope of the force-displacement curve while both β and θ play a role in the stress distribution and crack propagation. We found that these effects are coupled and the optimal set of parameters also depends on the fiber material. 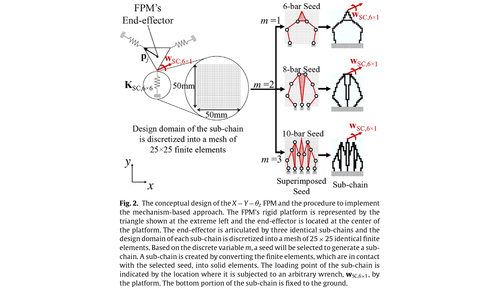 This is the first experimental verification of such optimal designs proposed for mushroomlike microfibers. This experimental approach could be used to evaluate a wide range of complex microstructured adhesive designs suggested in the literature and optimize them. Zhuang, J., Carlsen, R. W., Sitti, M.
The last decade has seen an increasing number of studies developing bacteria and other cell-integrated biohybrid microsystems. However, the highly stochastic motion of these microsystems severely limits their potential use. Here, we present a method that exploits the pH sensing of flagellated bacteria to realize robust drift control of multi-bacteria propelled microrobots. Under three specifically configured pH gradients, we demonstrate that the microrobots exhibit both unidirectional and bidirectional pH-tactic behaviors, which are also observed in free-swimming bacteria. From trajectory analysis, we find that the swimming direction and speed biases are two major factors that contribute to their tactic drift motion. 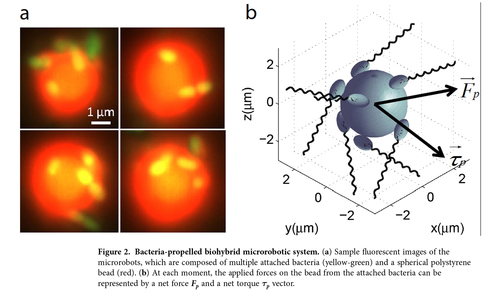 The motion analysis of microrobots also sheds light on the propulsion dynamics of the flagellated bacteria as bioactuators. It is expected that similar driving mechanisms are shared among pH-taxis, chemotaxis, and thermotaxis. By identifying the mechanism that drives the tactic behavior of bacteria-propelled microsystems, this study opens up an avenue towards improving the control of biohybrid microsystems. Furthermore, assuming that it is possible to tune the preferred pH of bioactuators by genetic engineering, these biohybrid microsystems could potentially be applied to sense the pH gradient induced by cancerous cells in stagnant fluids inside human body and realize targeted drug delivery. Han, Y., Marvi, H., Sitti, M.
Vibration-driven locomotion has been widely used for crawling robot studies. Such robots usually have a vibration motor as the actuator and a fibrillar structure for providing directional friction on the substrate. However, there has not been any studies about the effect of fiber structure on robot crawling performance. In this paper, we develop Fiberbot, a custom made mini vibration robot, for studying the effect of fiber angle on robot velocity, steering, and climbing performance. It is known that the friction force with and against fibers depends on the fiber angle. Thus, we first present a new fabrication method for making millimeter scale fibers at a wide range of angles. We then show that using 30° angle fibers that have the highest friction anisotropy (ratio of backward to forward friction force) among the other fibers we fabricated in this study, Fiberbot speed on glass increases to 13.8±0.4 cm/s (compared to ν = 0.6±0.1 cm/s using vertical fibers). We also demonstrate that the locomotion direction of Fiberbot depends on the tilting direction of fibers and we can steer the robot by rotating the fiber pad. Fiberbot could also climb on glass at inclinations of up to 10° when equipped with fibers of high friction anisotropy. We show that adding a rigid tail to the robot it can climb on glass at 25° inclines. Moreover, the robot is able to crawl on rough surfaces such as wood (ν = 10.0±0.2 cm/s using 30° fiber pad). Fiberbot, a low-cost vibration robot equipped with a custom-designed fiber pad with steering and climbing capabilities could be used for studies on collective behavior on a wide range of topographies as well as search and exploratory missions. Song, J., Shawky, J. H., Kim, Y., Hazar, M., LeDuc, P. R., Sitti, M., Davidson, L. A. Cells in tissues encounter a range of physical cues as they migrate. Probing single cell and collective migratory responses to physically defined three-dimensional (3D) microenvironments and the factors that modulate those responses are critical to understanding how tissue migration is regulated during development, regeneration, and cancer. 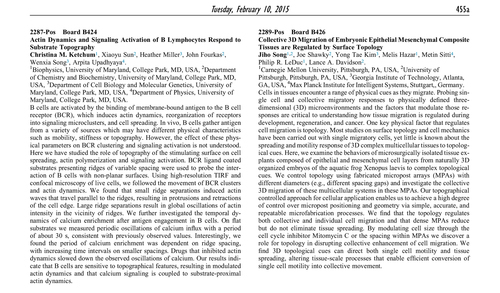 One key physical factor that regulates cell migration is topography. Most studies on surface topography and cell mechanics have been carried out with single migratory cells, yet little is known about the spreading and motility response of 3D complex multi-cellular tissues to topographical cues. Here, we examine the response to complex topographical cues of microsurgically isolated tissue explants composed of epithelial and mesenchymal cell layers from naturally 3D organized embryos of the aquatic frog Xenopus laevis. We control topography using fabricated micropost arrays (MPAs) and investigate the collective 3D migration of these multi-cellular systems in these MPAs. We find that the topography regulates both collective and individual cell migration and that dense MPAs reduce but do not eliminate tissue spreading. By modulating cell size through the cell cycle inhibitor Mitomycin C or the spacing of the MPAs we uncover how 3D topographical cues disrupt collective cell migration. 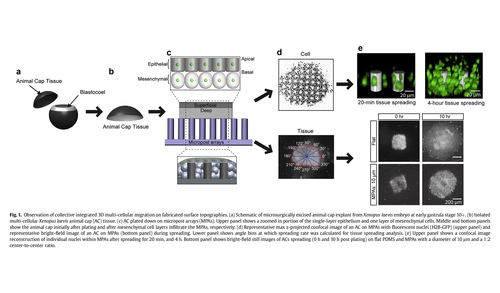 We find surface topography can direct both single cell motility and tissue spreading, altering tissue-scale processes that enable efficient conversion of single cell motility into collective movement. Wu, H., Sariola, V., Zhu, C., Zhao, J., Sitti, M., Bettinger, C. J. Fabrication schemes that integrate inorganic microstructures with hydrogel substrates are essential for advancing flexible electronics. 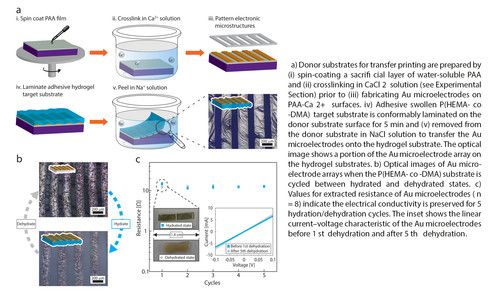 A transfer printing process that is made possible through the design and synthesis of adhesion-promoting hydrogels as target substrates is reported. This fabrication technique may advance ultracompliant electronics by melding microfabricated structures with swollen hydrogel substrates. Song, J., Shawky, J., Kim, Y. T., Hazar, M., Sitti, M., LeDuc, P. R., Davidson, L. A. Cells in tissues encounter a range of physical cues as they migrate. Probing single cell and collective migratory responses to physically defined three-dimensional (3D) microenvironments and the factors that modulate those responses are critical to understanding how tissue migration is regulated during development, regeneration, and cancer. One key physical factor that regulates cell migration is topology. Most studies on surface topology and cell mechanics have been carried out with single migratory cells, yet little is known about the spreading and motility response of 3D complex multicellular tissues to topological cues. Here, we examine the behaviors of microsurgically isolated tissue explants composed of epithelial and mesenchymal cell layers from naturally 3D organized embryos of the aquatic frog Xenopus laevis to complex topological cues. We control topology using fabricated micropost arrays (MPAs) with different diameters (e.g., different spacing gaps) and investigate the collective 3D migration of these multicellular systems in these MPAs. 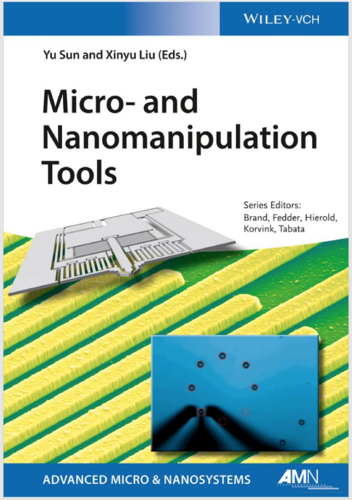 Our topographical controlled approach for cellular application enables us to achieve a high degree of control over micropost positioning and geometry via simple, accurate, and repeatable microfabrication processes. We find that the topology regulates both collective and individual cell migration and that dense MPAs reduce but do not eliminate tissue spreading. By modulating cell size through the cell cycle inhibitor Mitomycin C or the spacing within MPAs we discover a role for topology in disrupting collective enhancement of cell migration. We find 3D topological cues can direct both single cell motility and tissue spreading, altering tissue-scale processes that enable efficient conversion of single cell motility into collective movement. 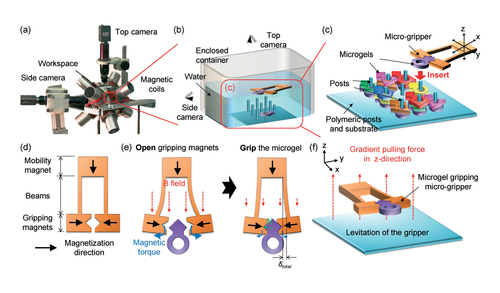 Chung, S. E., Dong, X., Sitti, M.
Three-dimensional (3D) heterogeneous assembly of coded microgels in enclosed aquatic environments is demonstrated using a remotely actuated and controlled magnetic microgripper by a customized electromagnetic coil system. 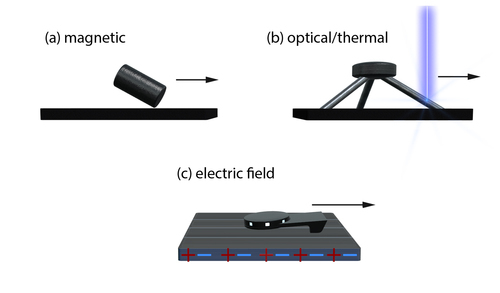 The microgripper uses different ‘stick–slip’ and ‘rolling’ locomotion in 2D and also levitation in 3D by magnetic gradient-based pulling force. This enables the microrobot to precisely manipulate each microgel by controlling its position and orientation in all x–y–z directions. Our microrobotic assembly method broke the barrier of limitation on the number of assembled microgel layers, because it enabled precise 3D levitation of the microgripper. We used the gripper to assemble microgels that had been coded with different colours and shapes onto prefabricated polymeric microposts. This eliminates the need for extra secondary cross-linking to fix the final construct. 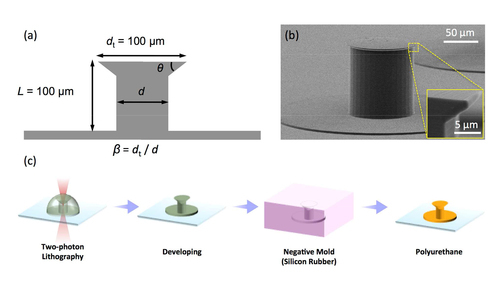 We demonstrated assembly of microgels on a single micropost up to ten layers. By increasing the number and changing the distribution of the posts, complex heterogeneous microsystems were possible to construct in 3D. 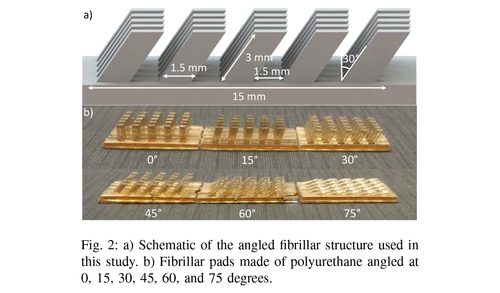 In this letter, we propose a technique by which we can actively adjust frictional properties of elastic fibrillar structures in different directions. Using a mesh attached to a two degree-of-freedom linear stage, we controlled the active length and the tilt angle of fibers, independently. 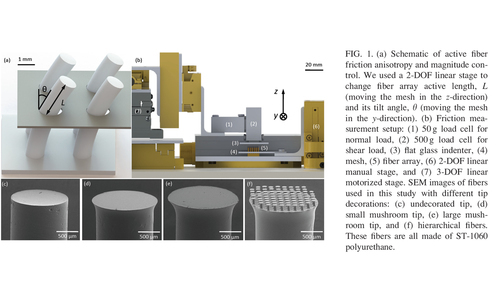 Thus, we were able to achieve desired levels of friction forces in different directions and significantly improve passive friction anisotropies observed in the same fiber arrays. The proposed technique would allow us to readily control the friction anisotropy and the friction magnitude of fibrillar structures in any planar direction.